With petals that remind us of fine silk, Iris reticulata ‘Katharine Hodgkin’ , although a dwarf iris this one is big on appeal. This cultivar is from the UK where it was named after Katherine Hodgkin wife of Eliot Hodgkin a noted plantsman. With its almost paisley patterned flowers it is appropriated that his was bred in the 1960s, ‘flower power’ at its best. If you are looking for a reliable Iris for the rock garden that will attract a host of comments than this could be it. It is a hybrid between Iris histriodes and Iris winogradowii and as such is propagated by division. We grow our Iris reticulata ‘Katharine Hodgkin’ is both containers and in a raised rock garden. Over time we have found it to be reliable in the rock garden. Best grown in a sunny position in a humus rich well drained soil. 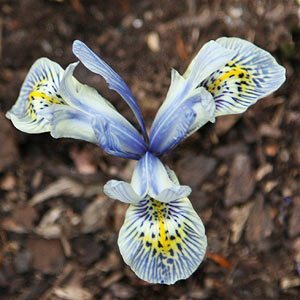 Like all of the Reticulata Iris, ‘Katharine Hodgkin’ really needs to go into the ground after a year or two to maintain vigour. Flowers – Winter to spring very pale blue and deeper blue petals with deeper falls marked with a deeper blue, yellow and white.